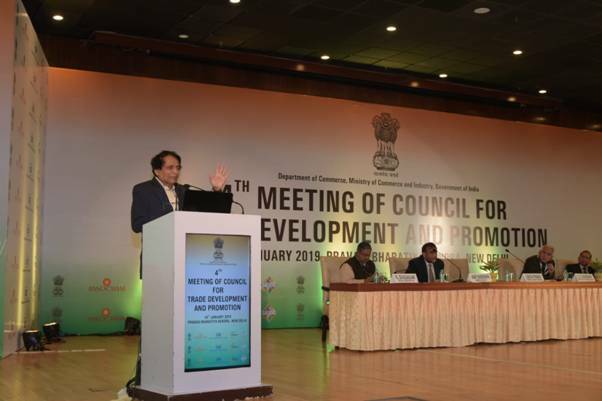 The 4th meeting of the Council for Trade Development and Promotion (CTDP), chaired by Union Minister for Commerce & Industry and Civil Aviation, Suresh Prabhu, was held in New Delhi. 10 states including Arunachal Pradesh, Assam, Karnataka, Odisha, Tamil Nadu, Punjab, Nagaland, Uttarakhand and Uttar Pradesh attended this meeting. The main aims of the meeting tapping into the global value and supply chain by promoting the export of services, organic agricultural produce, in corporate value addition to agricultural products and fully utilize all the schemes and programmes of the Government of India. Government of India has formulated an Agricultural Export Policy for the first time with a focused plan to boost India’s agricultural exports to USD 60 billion by 2022. Suresh Prabhu informed the Council regarding efforts being made by the Central Government in preparing a development plan for each and every district so that growth is led from the district upwards which will be a game changer in taking India’s GDP to USD 5 trillion in 2025.